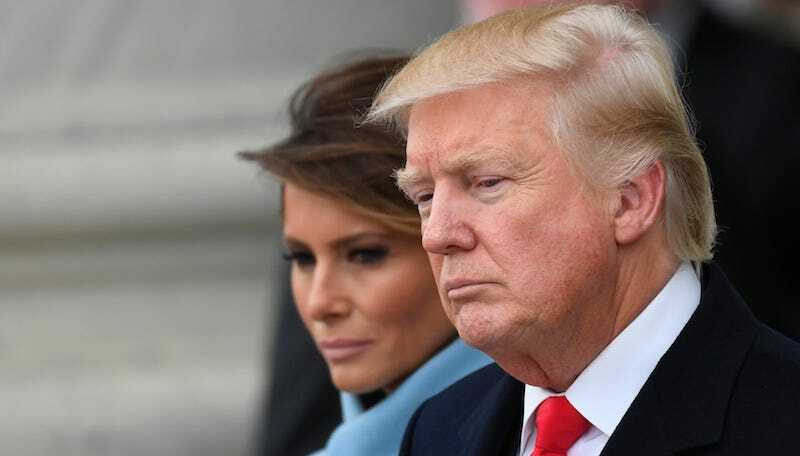 Donald Trump and his wife, Melania Trump, are now our president and first lady. But for how long? Donald Trump has made no secret of his admiration for Ronald Reagan, an actor-turned-president who governed our country even in the face of his rumored deteriorating mental state. He even borrowed, and then copyrighted, Reagan’s “Make America Great Again” slogan. But there’s more—until Trump, Reagan was the only divorcée to ascend to the presidency. But Trump has never been content to merely follow in someone’s footsteps. Could he be the first president to actually get divorced while in the White House? Either way, the Trumps certainly don’t mind spending time away from each other. In fact, Melania won’t be joining him in the White House until at least the summer, when Baron’s school term and her most convenient excuse for remaining in New York both expire. What will happen then? Only time—and their body language—will tell. What happens when he grabs her hand. The way her smile drops as soon as he turns around.